If you’ve ever had to lug a bike with you onto the train or bus, or up a steep flight of stairs, you can probably understand the appeal of lightweight folding bikes. But most of them are too light-weight to handle the demands of serious riders. Dominic Hargreaves was having the same struggles with folding bikes, and after failing to find one that he liked, he decided to make one for himself. 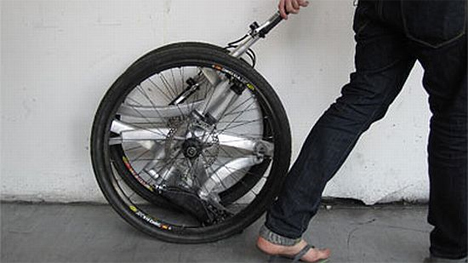 The result was The Contortionist, a folding bike that twists around to fold itself entirely into the wheels’ 26-inch circumference. Besides being able to fold down to a previously-unattained size, the bike can go from fully extended to fully folded in just 20 seconds. We expect it would take a bit of practice to get it down to 20 seconds, but it’s still possible. When it’s fully folded, the rider can simply pull it along behind him. The bike was a favorite in the James Dyson Award for 2009, a design competition that rewards innovative product designs and inventions. Hargreaves’ entry didn’t win, but he has been in contact with manufacturers and hopes to have the bike in production soon. See more in Bikes & Cycles or under Transportation. November, 2009.